CENTRAL bank chief Veerathai Santiprabhob has urged the government to speed up an overhaul of regulations required for the digital economy. The government’s plan to use Section 44 to allow Chinese engineers to speed up the construction of the Thai-Sino railway project has drawn a mixed response, with some critics claiming the move discriminates against Thai workers. THE NATIONAL telecom watchdog will summon three major telecom operators over the recent discovery of more than 300,000 SIM cards allegedly used to manipulate Chinese social media. The Prime Minister has affirmed that the government attaches significance to the problem of terrorism and has been cooperating with other countries to prevent it. Members of the European-ASEAN Business Alliance (EABA) have paid a courtesy call on Prime Minister Gen Prayut Chan-o-cha and expressed support for the Thailand 4.0 policy. Thai people are walking to local government offices to answer Prayut’s four questions on elections. But one Pheu Thai politician has gotten the privilege of being visited by a group of soldiers demanding his views on the junta head’s survey. When the junta leader uses his absolute power next week to overcome legal obstacles to a high-speed rail line, it will skirt five laws on the books, including two it put in place since coming to power. Bids for public-private partnerships (PPP) to operate and maintain two motorways worth 140 billion baht are expected to be completed this year. The Government Savings Bank (GSB) and the Stock Exchange of Thailand (SET) have established a special fund for SMEs in addition to the bank’s current credit offerings. The junta’s cabinet has given the greenlight to the Ministry of Defence to spend 2.3 billion baht for buying tanks from China. BG CONTAINER GLASS (BGC), a subsidiary of Bangkok Glass, yesterday announced it was building its latest glass-container factory in Ratchaburi at a cost of Bt2 billion. In enacting the government’s 20 year national development strategy, the Ministry of Commerce has joined with the Ministry of Interior to allow people contacting it to only need their identification cards. The Department of Industrial Promotion (DIP) has launched five applications to encourage entrepreneurs to utilize online communication channels with their businesses. The Rural Doctors’ Association (RDA) has criticised the junta’s plans to amend the National Health Security Act, arguing it has overlooked the interests of the people. The Phuket Governor has invited citizens to respond to Prime Minister Gen Prayuth Chan-o-cha’s televised and nationally broadcast poll regarding governance and politics in Thailand. The Commander of the Royal Thai Army has insisted that the purchase of armored vehicles from China was properly considered and approved by the Cabinet. The Cabinet has given approval to four measures aimed to provide support for rubber farmers after they were affected by the rubber price drop. 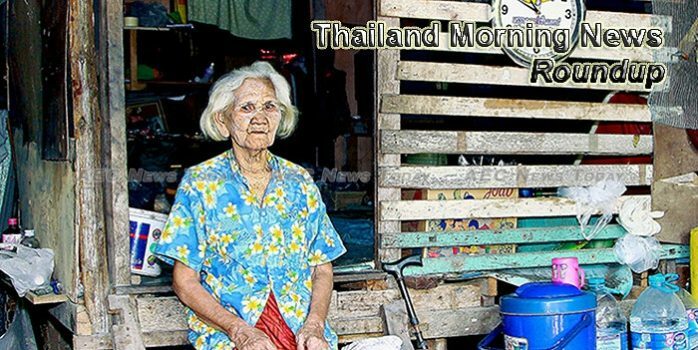 The Stock Exchange of Thailand (SET) has collaborated with an academic institution to analyze saving rates in order to help people have sufficient money for their retirement. Thailand Post has introduced the first postage stamp of His Majesty King Rama X on an auspicious occasion of His Majesty’s 65th birthday.